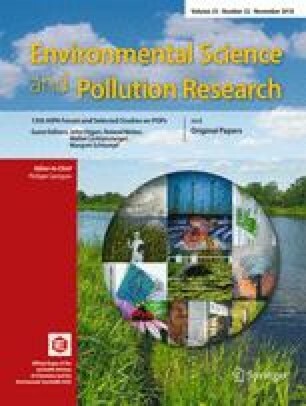 Toxicity of linear alkylbenzene sulfonate to aquatic plant Potamogeton perfoliatus L.
Aquatic plants play an important role in maintaining the health of water environment in nature. Studies have shown that linear alkylbenzene sulfonate (LAS), a type of omnipresent pollutant, can cause toxic damage to aquatic plants. In the present research, we studied the physiological and growth response of submerged plant Potamogeton perfoliatus L. to different concentrations of LAS (0.1, 1.0, 10.0, 20.0, and 50.0 mg l−1). The results showed that LAS is toxic to P. perfoliatus, and the toxicity is dose-dependent. Only slightly reversible oxidative damages were observed in the physiological parameters of P. perfoliatus when P. perfoliatus was exposed to lower LAS doses (< 10 mg l−1): soluble sugar, soluble protein, H2O2, and malondialdehyde (MDA) content in P. perfoliatus increased significantly at 0.1 mg l−1 and then returned to normal levels at 1.0 mg l−1. Antioxidant enzymes were activated before the LAS concentration reached 10 mg l−1, and the activities of superoxide dismutase (SOD), catalase (CAT), and photosynthesis pigment content declined significantly when the concentration of LAS exceeded 10 mg l−1. In addition, at higher concentrations (20–50 mg l−1) of LAS, dry weight and fresh weight of P. perfoliatus showed significant declines. The results indicate that LAS above 10 mg l−1 can cause serious physiological and growth damage to P. perfoliatus. This research was funded by the National Natural Science Foundation of China (No. 31270410, No. 30970303), the Special Foundation of National Science and Technology Basic Research (2013FY112300), and the Scientific Research Project of Hubei Province Environmental Protection Department (2014HB07).